After posting an inspirational win against perennial front-runners Gai Wu last week, Borrelli Walsh USRC Tigers kept its attack sharp with a 82-0 drubbing of First Pacific SCAA Causeway Bay Phoenix this afternoon at KGV. It was the highest margin of victory in this season’s KPMG Premiership as Tigers look set to threaten the traditional dominance of Societe Generale Valley and Gai Wu across the second half of the season. Natixis HKFC beat Plastic Free Seas City Sparkle 43-3, Gai Wu beat Transact24 Tai Po Dragons 65-5 and Valley beat Kerry Hotel Kowloon 20-0 in other matches in the penultimate league round in 2018. The heavy win keeps Tigers in the safety zone ahead of the planned split into Premiership and Premiership A leagues after next weekend’s final round, but Gai Wu’s scalping of the Dragons was enough to keep a share of second place on the table behind unbeaten Valley. Ahead of the match, coach Fan Shun-kei wanted his team to keep its attack sharp and he got what he asked for as Tigers posted 14 tries, eight in the first half and a further six after the break, en route to posting the biggest margin of victory to date in the league this season. “It was another good performance and I was really pleased with the way the squad is starting to direct itself. The senior players are really stepping up and taking the new players under their wing and executing our strategy on the field,” said Fan after the game. Charlotte Myrans led the Tigers in scoring, with six conversions and a brace of tries in the second half, to account for 22 of Tigers’ 82 points. Natasha Olson-Thorne got in on the action with a hat-trick, while another newly minted Hong Kong international - centre Sarah Lucas - scored the game’s first two tries in succession (bookending a damaging yellow card against Tai Po’s Lam Ka-wai in the 8th minute), and circled around late in the match for a hat-trick of her own. Four other players scored for Tigers, with Chloe Baltazar and Wong Kai-ying both collecting braces, and Lau Tsz-ki and Amy Pyle adding tries as well. For a second straight outing, Fan was able to use a combined sides approach - with Tigers sporting newfound depth at nearly every position - integrating his newly available Hong Kong internationals after recent fifteens and sevens duty, with top emerging age grade talent in Maelle Picut, Lara Schats and new find Baltazar, who marked her first senior cap for Tigers today with two tries. “Chloe has been playing for our U19s team and stepped up to NL1 this season and now into the Prem. She really stood out for us today and I think it shows that we are finally starting to establish depth across positions and now have a more interchangeable side we can use going forward. “I think if Chloe can continue to develop and learn at this rate she could have a good chance to make the national team as well,” Fan added. Tigers now have a taste for success and that growing self-belief promises to usher in new competition at the elite edge of the game, with the Kowloon club having no qualms about pressing a claim for the league title, usually reserved for Valley or Gai Wu. “Today we tried to create momentum for next week, so we can finish the first half of the season positively. I expect them to keep that momentum going now. We have one game left against Football Club and I expect us to keep our foot on the gas and to come back after the break ready to play again. “The bottom half of the season [ed: following the split in the Premiership] is the real deal. We need to carry that momentum forward into the new year and continue to deepen our understanding of what we want to see on the pitch,” said Fan. Stinging from its surprise 34-5 loss to Tigers last weekend, Gai Wu bounced back with a heavy win over Tai Po Dragons. 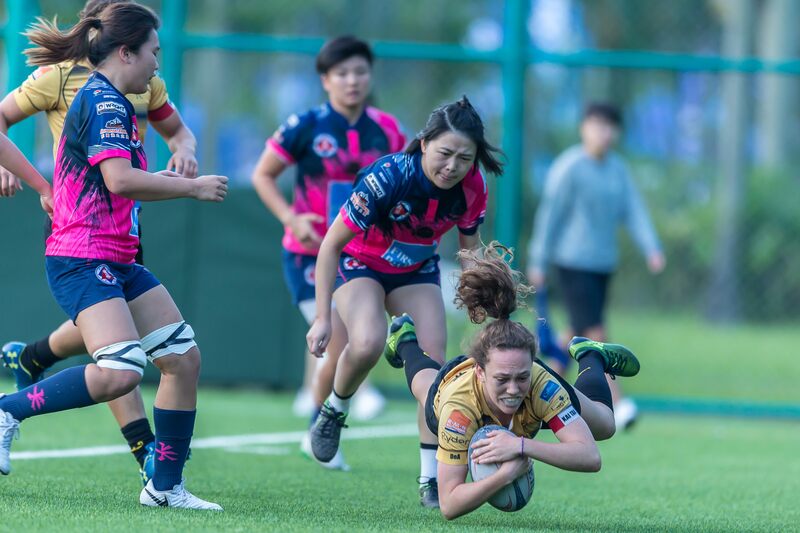 The club’s new transfer, Stephanie Chan, who received her first 15s cap for Hong Kong against Spain last month, was influential today, contributing a try and five conversions in the 65-5 win. Fellow sevens international Melody Li added two tries, as did Lo Pui-shan. Six other Falcons joined the score sheet in the 11-try fest, while centre Oyinlola Kim Lee scored the Dragons’ only points mid-way through the first half. Hong Kong Football Club look the likely front-runners in the Premiership A competition in the new year after beating City Sparkle 43-3, behind hat-tricks from captain Rachel Fong and Elizabeth Musgrove. Football Club leapt out to a 19-0 lead after forty minutes with Fong setting the pace with her first try coming after 9 minutes. They grew their lead to 19-0 by the break after successive tries from Scotland sevens international Musgrove in the final ten minutes of the half. The second half was more of the same, with Fong again starting the scoring early, scoring her second try in the 42nd minute, followed by Musgrove’s hat-trick strike seven minutes later. Dragons scored through a penalty from Agnes Tse in the 55th minute and then held Football Club off the board for most of the second half, before conceding late tries to flanker Jackie Leung and Fong, who collected her hat trick in the 78th minute, converting her own try to bring the final score to 43-3. Valley’s smooth 20-0 defeat of Kowloon was enough to keep them clear of the competition at the top of the table on 30 points, extending their unbeaten record to six matches – with a perfect six for six bonus points on the year. Tigers and Falcons remain level in tied-second on 25 points with Kowloon’s loss seeing them drop a point in the standings to Causeway Bay with both teams tied-fourth on 14 points ahead of their head-to-head play-off next Saturday. HKFC are in sole possession of sixth place on 11 points followed by Tai Po with 2 points and City Sparkle still hunting for its first win of the campaign.